Faithful to its myth, the Mont Blanc is no doubt one of the most beautiful massifs of the Alps. Our circuit will lead you from France to Italy and Switzerland in order to discover its various faces. The sceneries are stunning with innumerable alpine peaks and beautiful glaciers all around with the impressive Mont Blanc massif constantly in the background. This walk is reasonably demanding, but you only need to carry a light back each day and in the evening you will enjoy French and Italian cooking and Swiss hospitality in the traditional alpine villages you stay in. A complete hiking itinerary with luggage transport, an incontestable must of alpine trekking. Arrival in the charming, traditional village of St-Gervais. Discover the village depending on your arrival time. Overnight in a 3* hotel (wifi available), half-board. 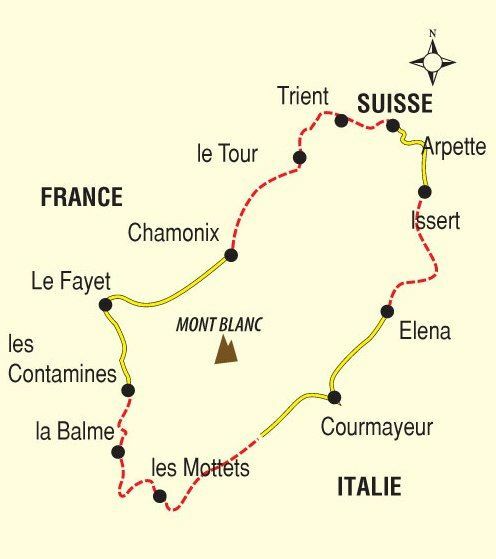 Take the “little train of Mont Blanc” up to the pass of Voza (Col de Voza). Alight from the train at Voza and hike to Bellevue (1km). From Bellevue, you take the GR Tour du Mont Blanc and start the ascent of the pass of Tricot (Col du Tricot). Descent until the refuge chalet de Miage. You then hike up to the refuge chalet du Truc. From chalet de Miage to chalet du Truc, you enjoy hiking on the alps pastures, and the great views on the Dôme de Miage mountain, as well as the Miage glacier that descent in the valley. You then descent until Les Contamines. Overnight in les Contamines in a hotel 2* (wifi available), half-board. A short transfer (included) to Notre Dame de la Gorge. Climb over the Col du Bonhomme and the Col de la Croix du Bonhomme leading to the Chapieux valley. Over the Aiguille des Glaciers, you will find be in the midst of splendid sights. Overnight in dormitory/room in the mountain lodge “la Nova” (no wifi, no phone network), half-board. Enjoy a rest day in Courmayeur. You can enjoy walking around town, or visit the famous Giardino Botanico Alpino Saussurea (€27 round trip, €18 one way), the highest botanical garden in Europe, 2173 metres above sea level! It is located at Pavillon du Mont Fréty. The garden can be access by cable car to enjoy an astonishing view from the high peaks of the massif. Overnight in a 3* hotel (wifi available) in B&B. From Courmayeur take a bus to Arpnouvaz (€3.5 per person) for 20 minutes (13km). Start the hike from Amuva. Cross the Grand Col Ferret and arrive in the quaint but beautiful village of La Fouly in Switzerland. Enjoy the exceptional views over the massif of Combins in the East and on the Italian side of Mont Blanc. From la Fouly, transfer by postal bus to Champex (19km, 35 minutes, CHF 13,6 per person). A private transfer is available for €220 for 8 people. Champex is a Swiss village boasting a beautiful lake. Overnight in a 3* hotel (wifi available), half-board. The highest point of the walk is reached today as you climb over the Fenêtre d’Arpette (2750m). Savor the breath-taking views while you go down alongside the Trient glacier. In case of uncertain weather, we propose a shorter itinerary by the Col de Bovine pass. In this scenario, you may expect 5h30 of walking, +800m, -1135m. Overnight in dormitory in Col de la Forclaz half-board or room in apartment of 4 persons in Trient half-board. Over the Col de la Balme and back to France with fantastic views on the Mont Blanc and Aiguille Verte, you will have the option of 2 alternative routes for the descent to the village of Argentières. Overnight in a 3* hotel in Argentières (wifi available), half-board. Enjoy wonderful Balcon des Aiguilles Rouges, before a climb to Lac Blanc. Take in all the beautiful surrounding scenery : Aiguille Verte, Les Drus, La Mer de glace, Aiguilles de Chamonix, Mont Blanc du Tacul, Aiguille du Goûter, and last but not least, Mont Blanc! Descend to Chamonix by Le Praz. You can also choose to take the cableway of La Flégère to le Praz (€14 per person) or even by bus from le Praz to Chamonix (€1,5 per person / transfers not included in the price). Overnight in hotel 4 **** in Chamonix (wifi available), B&B. Enjoy the charming town of Chamonix. Why not take the cable car to the top of the Aiguille du Midi (€31,5 per person, not included) : if the weather is clear, it is an unforgettable experience! Overnight in hotel 4**** in Chamonix (wifi available), B&B. A deposit of S$ 1000 per person is required for confirmation. Balance payment t0 be paid by 45 days before departure. Notification of cancellation must be made in writing. Upon cancellation, the guest shall be liable to pay a fee to cover the estimate of cost and expenses incurred by X-Trekkers and/or its partners. This is expressed as a percentage of the total price and is calculated as indicated in Table B. All administration fees, taxes, charges or levies imposed shall be borne by the guest. Average to good walker, you need to have hiking experience with 4-7h of walk per day (or even 9hrs!) and +300m to +1200m of ascent by day. You only carry a back pack for the day with the necessary for your hike and the packed lunch. Your luggage will be transported by vehicle. Each person only allows 1 luggage of max weight 15kg for the luggage transport. 11 days, 10 nights, 7 days walking. “Dormitory” for July Departure ~ Accommodation in lodges in dormitories with shared facilities (showers and toilets) on day 3 (Chapieux) and on day 8 (col de la Forclaz). “Room” ~ Accommodation in double or twin rooms (when available) with en-suite in hotel in St Gervais***, Les Contamines**, Chapieux Mountain Lodge, Courmayeur***, Trient Apartment for 4-8 persons with shared toilet, Argentières*** and Chamonix****. Food: Half board with breakfast and dinner at all accommodations except in Courmayeur and Chamonix (B&B). Return by Chamonix Mont Blanc railway station. Geneva Airport is the closest one. Geneva airport -> St Gervais les Bains – Le Fayet www.sbb.ch , duration from 2 1⁄2 to 4 hrs ; 2 transfers. Chamonix Mont Blanc -> Geneva airport www.sbb.ch , duration about 3 1⁄2 hrs, via Martigny & Vallorcines. – From Geneva airport to Le Fayet ; about 45€ the way ; with reservation ; duration 2 1⁄2 hrs. – From Chamonix or Le Fayet to Geneva airport direct ; about 40€ the way ; with reservation ; duration 2 hrs. attention! They do not replace the hiking shoes. A comfortable rucksack (40 to 50 l). A 1l water flask, a knife, a flash light or a head lamp (+ an extra battery). Good sun glasses, sun screen cream.